I know I've heard it, and I'm pretty sure you have, too. "Eat healthy," we are warned, so that we can live long, happy, productive lives. Sure, it sounds good, but anyone who has tried to improve their diet knows that it is hard to do. We are surrounded by unhealthy food, and it can be difficult to know what is and is not actually going to improve our health, since different people make different claims and all swear that science is on their side. So what can you do? There are a few small changes that you could make to your diet today that are likely to help you reap rewards in the years to come. Most of these aren't too hard to do, once you realize they are important. While they won't change your diet completely, they're a great place to start if you want to eat with your health in mind. Unless you already monitor your sugar intake, you probably eat more of it than you think you do. Why? Because it's in everything from ketchup to soy sauce. Eating less sugar can have all sorts of good benefits for your body over time. It will lower your blood pressure and your bad cholesterol, keep your brain sharp, lower your risk of fatty liver disease, diabetes, and certain cancers, and improve your immune function. These are only a few of the ways sugar can affect your body. While you may not be at risk of something like diabetes right now, if you continue to eat so much sugar, you might be in 20 years. To start the process of cutting back, track your sugar intake for a few days or a week. Learn where the sugar in your diet comes from, then choose to cut one of those things out. If you keep replacing sugary foods with other options, you will slowly reduce the amount of sugar you eat. I know, I know — everyone and their mother says to drink green tea, these days. Apparently, there's a good reason for that. Green tea, when consumed in conjunction with a regular fitness regimen, apparently aids in fat burning and weight loss. In 20 years, you will weigh a lot less if you start drinking green tea now than you will if you don't. Even if you don't need to lose weight, the tea clearly helps your body function better and may protect you from some age-related weight gain. My problem with green tea is that it tastes like grass. Fortunately, they now make it in all sorts of flavors. In fact, if you like a particular flavor of regular tea, you can probably find that same flavor of green tea. It also comes refrigerated and infused with fruit essence, if you prefer an iced version. Overeating is a big deal, and it's way more common than it should be. It's one thing to eat a lot on Thanksgiving and your birthday, but entirely another to lose touch with your body's satiety signals and overeat all the time. Leaving a bite or two of food on your plate can help you learn to listen to your body again, because you won't be relying on an empty plate to tell you you're done. As it turns out, healthy fats don't make you gain weight, nor do they lead to higher chances of any disease. In fact, some people find it a bit easier to lose weight, over time, when they are sure to include healthy fats in their diet. Fats also help you feel less hungry, so you can consume less food overall and still feel satisfied. The key, when it comes to fats, hinges on which types you eat. Most of all, be sure to avoid trans fats. After that, limit your saturated fats but do not feel like you need to avoid them entirely. Beyond that, you can consume healthy fats as they fit into your diet and as you desire them. Eat a lot of nuts and avocados, and you should feel full and maintain your weight over time. Yogurt seems to help people maintain their weight as they get older. In an analysis of the diets of over 120,000 people, those who lost weight and maintained that loss, or maintained a healthy weight, seemed to eat a good amount of yogurt. No one is quite sure how all the pieces fit together here. Yogurt has live bacterial cultures, which may help the gut function better and so help the body find a healthy weight and stay there. It's important to find a yogurt that does not have a high sugar content. Many people find that they like to eat plain yogurt with a spoonful of honey or jam mixed in. It's likely an acquired taste, but one worth figuring out if it will keep your body healthy and strong for years into the future. 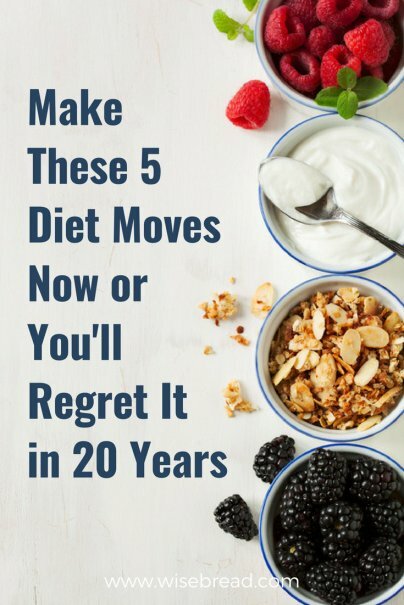 What dietary changes have you made with the long view in mind? How do you plan to stay healthy over the next 20 years? Or just eat below your calorie expenditure, have a healthy amount of proteins, fats and carbs. Don't stress too much about it.